Five years after her return home from Auschwitz, Piera Sonnino found the courage to tell the story of the extermination of her parents, three brothers, and two sisters by the Nazis. Discovered one year ago in Italy and never before published in English, this poignant and extraordinarily well-written account is strikingly accurate in bringing to life the methodical and relentless erosion of the freedoms and human dignity of the Italian Jews, from Mussolini's racial laws of 1938 to the institutionalized horror of Auschwitz. Through Sonnino's words, memory has the power to disarm these unspeakable evils. 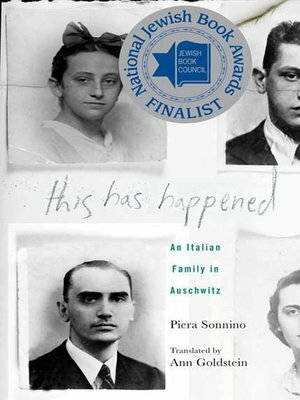 Piera Sonnino, author of This Has Happened, was deported to Auschwitz in 1944. She was later transferred to Bergen-Belsen and Braunschweig. The sole survivor of a family of eight, she returned to Italy in 1950. She died in 1999.